Like most adults, I was first introduced to “amber” while sitting terrified in a movie theater. It popped up again when my babies were teething. Friends kept asking me if I had ever tried “those amber teething necklaces”. I immediately pictured my little babushka gnawing on a giant golden nugget with a mosquito trapped inside, so I never took the plunge and tried them. My loss. They probably would have helped my nightmare teether, Elena. But before you launch off and start your google searching, let me offer up the most common mistakes people make when purchasing an amber teething necklace. It will save you from dumping $45 on plastic yellow beads. Not understanding what they are. Not testing the final product. I realize that the whole “wear a necklace to help teething pain” can sound kind of hokey. I’m with you. I thought that way too. I’m somewhat of a skeptic when it comes to natural medicine. So the Mighty Moms and I reached out to Hazelaid and asked if they would donate teething necklaces to our fine subscribers so they could give us a “boots on the ground” kind of look into this teething remedy. 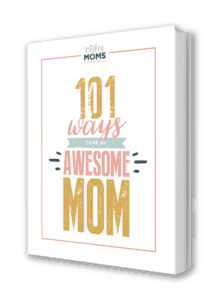 Each mom was given specific instructions (which they all followed) and asked to fill out a brief survey at the end of two weeks about their experience. Did you catch that last line on the infographic? 100% of the testers would highly recommend giving amber teething necklaces a try. When worn against the skin, body heat causes the amber to release an oil containing succinic acid, which when absorbed into the skin, works like a natural Ibuprofen, blocking pain and reducing inflammation. Inflammation is just a fancy-pants way of saying “this part of my body is swollen in flames of agony.” (That’s how I always remember it. Inflammation = swollen flames of agony.) So those puffy red gums on your baby’s sweet face? FLAMES OF AGONY. Time for the bloodstream to truck some succinic acid up there and soothe it to bliss. You don’t want amber teething necklace from just anywhere. You want the amber to come from the Baltic region, because amber from that region has been has been tested to show higher rates of succinic acid than anywhere else. Sure, I could sell you a Wisconsin amber teething necklace, but it would be just as effective as a necklace made of cheese curds. Location matters when it comes to amber teething necklaces. Hazelaid gets all their amber from Lithuania and tests each crate in various ways (some of which are mentioned below) to make sure that every little piece is 100% authentic Baltic amber. Here are the most common “imposters” in the amber teething necklace market. Copal ~ often sold as amber, copal is like adolescent amber – not quite matured to be effective. Celluloid ~ looks like amber, but is an imposter. Pressed Amber ~ this is actually amber, but fused together under high pressure. Since the natural pieces are compressed, the succinic acid in each is also compressed, making it less effective. Why spend money on something that doesn’t work as well (Pressed Amber) or, worse, doesn’t do anything but look pretty (all the others). If you’re trying to look like you’re using an amber teething necklace, any of these will work. But if you’re actually wanting the amber teething necklace to help, stick with the real deal. This necklace (or bracelet or anklet if you prefer) is going to be sitting against your baby’s skin, under his clothing. the clasp is either a pop-clasp or a screw clasp. No hook and eyes! the necklace isn’t too tight to be constrictive, nor too lose to get tangled around anything. It has to fit just right! Do you know what I like more than saving money? I wouldn’t shop for amber teething necklaces there. Here’s why. Auction Sellers are flash-in-the-pan sellers. If their product was revealed to be a fake, Google will bury those reviews at the bottom of the search pile. No one will ever know. Besides, what normal parent is going to extensive testing to make sure it’s real? Plus, they are less likely to give you the finer details on the amber in the description section – like how it’s tied, where specifically the amber came from, what tests have been used to verify it’s authenticity, etc. Established companies (like Hazelaid) have their entire business on the line with every sale. If one of their customers starts raising a fuss, Google will happily put that on the front page. Goodbye shoppers. They can’t afford to sell hooey. It’s got to work. There are a few at-home tests you can conduct to make sure your amber teething necklace is the real deal. Time for science! Yes. If you have Acetone, an IR-spectroscopy, or don’t mind burning your brand-new necklace. Hazelaid shares how they test their Baltic amber and offers a few other do-at-home versions (the UV Light one is pretty cool) in this article. Remember, amber is considered a precious gem. This means any necklace you purchase now, can be still helping your great grandchildren. Probably one of the most least expensive family heirloom possible. Question: My son iso fussy and can’t sleep well with his amber necklace. Does anyone else have this happen? I bought it looking for a relief to his teething and drooling. As soon as I got it in i did a check to see if it was real and it passed so I put it on him. I noticed that first night he did not sleep well but it not think much of it. The next day I noticed his drooling has almost stopped so I was happy. I did notice he was not taking his naps and when he did he did not sleep long or well. Today as soon as I took it off he fell asleep and stayed. I LOVE our teething necklace! My boy had two teeth and FOUR molars surface at once and he would scream day in and day out, he wouldn’t sleep and he always wanted cuddles (unlike him). Within 3 hours of him wearing his amber teething necklace he was his little mischievous self again! Now I just need to convince my husband to buy another one for our 3 month old! Going to the Hazelaid website, i noticed there are several styles/types of amber necklaces. Is there a difference in effectiveness or just style? My little one is 8 months, chewing everything, and still no teeth…? Hope this helps your little one! Hi, I’ve been doing research for our future LO, our first (and will be adopted). I found the concept of the Amber necklace interesting, and even after reading some of the nasty stories of people leaving them on at night, I think I’ll try it when those little white monsters start popping up. Do you know anything about the cleaning of these necklaces? Even though it’ll only be against her skin, between sweat and just life, I foresee it needing some cleaning. Thank you for any help, but no problem if you don’t know. And thank you sososo much for these articles, they’ve been a huge help! We have an amber necklace (actually, a hazel wood/amber necklace since our little one has eczema too!) and you really only need to clean it with water. It’s pretty easy. Glad the articles were a help to you! You always need to supervise your child when wearing the amber necklace just as you would monitor their involvement with anything else for maximum safety teething amber necklaces are designed to wear – not to chew – so your oversight is most important. So these are safe to use at night as well? My little guy HATES stuff on his feet so we wears long sleeved pjs with footless pj pants. Would an anklet be best? The necklace at night makes me nervous. You definitely need to do what you are comfortable. We only had our little one wear it on her ankle until she started moving more. After that we just took it off at night. It made us nervous so it wasn’t worth it! Too scary! I was horrified when I saw this strangulation risk on Facebook in the past year. That is scary Amy! From reading the article, though, it’s clear that the necklace was the wrong size for her child. Any necklace that allows for an arm to fit through is too big. It’s important that you order the right size – like Goldilocks. Not too big. Not too small. Just right. If you’re still uncomfortable with the idea, then I would suggest trying a bracelet or anklet that can be kept under a sock. You could also choose to only use the necklace at night, tucked against the skin under a sleeper. I have been skeptical of these, but I’ll try them. I know you preach the gospel truth and after 4 teeth in 1 week (twins) and a very tired mama, I need to try something else. I know what you mean. I was really excited to see our testers respond so favorably. I hope it can help! After less than a week with these necklaces, I am completely sold. The first day they had them on, I came home to happy giggly babies. My husband, I, and our nanny have all commented that they have been in a great mood all week. Even when the teething wasn’t bad, I never realized that it was constantly affecting them. I only wish I had tried them earlier. SO glad to hear they are helping! Sometimes the best way to test something is just to try it yourself. Thanks Betsy, for sharing your experience! Wow, this is such a helpful article! It takes away the “smoke and mirrors” that have surrounded these necklaces for so long. Can’t wait to try the saltwater test on the one I own.